Question: There are Barn Swallows nesting on the side of our garage and they dive-bomb me and my husband whenever we go to the garage. Is there anything we can do to prevent this from happening (without harming the birds, of course)? Barn Swallows are fiercely territorial and will dive bomb anyone who gets close to their nest site. They have been known to hit people while doing this and yes, it may hurt you when it happens. But they won’t hit you on purpose as it will hurt them even more than you, birds being very fragile animals. Chances are, if the swallows are dive-bombing you, it is because they have eggs or young in their nest. Relocating the nest and young is not a good idea so for this year, I would suggest trying to access the garage through another route. This may well be an inconvenience but it won’t be for long as the swallows will stop defending their nest as soon as the young have fledged and are able to fly on their own. Before the next breeding season, check the outside of your garage for any platform or spot where a Barn Swallow can build a nest. It doesn’t have to be a large spot; swallows need only a small ledge or protrusion with a clear access route in order to consider it a good nest site. The tops of wall studs, a small shelf, even the top of a light fixture can be used to anchor a nest site. Once you have located all of the potential nest sites, you will need to close off access to them in the spring before the swallows arrive. Plastic screen mesh is available from hardware stores and can be cut to size with scissors and stapled around any potential nest platform. The idea is to close off access to good sites. Once the swallows have had a look at your garage and are unable to find any good, accessible sites, they will move on to another area. 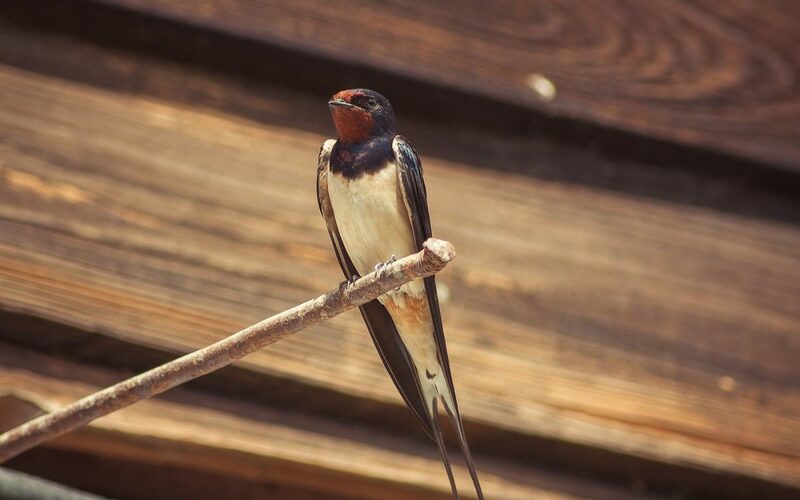 If you like having Barn Swallows around your house and yard, but not close enough that you and the swallows are getting in each other’s way, it is relatively easy to install some good nesting sites away from the house and garage. A very simple nest box would consist of three small pieces of wood (say 8″ by 8″ in size), nailed together to form three sides of a square, and mounted vertically on the side of a tree trunk or fence post such that one side is the roof and the opposite side is the floor. Placed in a site which is protected from the weather (i.e., rain), this simple nesting platform will entice the swallows to nest near your house but away from your garage. That way, both you and the swallows can pass a pleasant summer without constant battles whenever you head out to the garage.